I’m not great at playing horror games, they make me tense and I can only handle so much tension. I don’t think that’s too uncommon, I’m sure lots of people are scared by horror games. But there is something else that freaks me out more than ghosts, more than zombies, more than any jump scare you can find and that is the open seas. It kind of all started with Far Cry 3, well that’s my earliest memory of it anyway. In Far Cry 3, just like other Far Cry games, you’d need to ‘collect’ animal skins in order to be able to upgrade things like pouch storage. One of the better upgrades required you to kill sharks. Most of the time you could see the sharks from land so you’d know if they were out there waiting for you. What I used to do was stand in the shallows and shoot arrows at them until they were dead, then I’d wade in to the water and quickly claim my prize. I specifically remember one occasion where I’d been shooting at a shark and I finally saw it go limp and start to sink, I quickly swam out to grab and noticed that I was in an area that was actually pretty deep, and the shark was sinking fast. Utter panic came across me as I scrambled to grab it (I wasn’t letting it get away, I’d worked too hard), but it was just sinking and sinking in to the dark murky depths and I bottled it, I quickly turned around and swam as fast as I could back to the shore all whilst feeling terrified that there was a shark following me about to bite my behind (there wasn’t). It was at that moment I decided I didn’t need any upgrades that required shark skin. 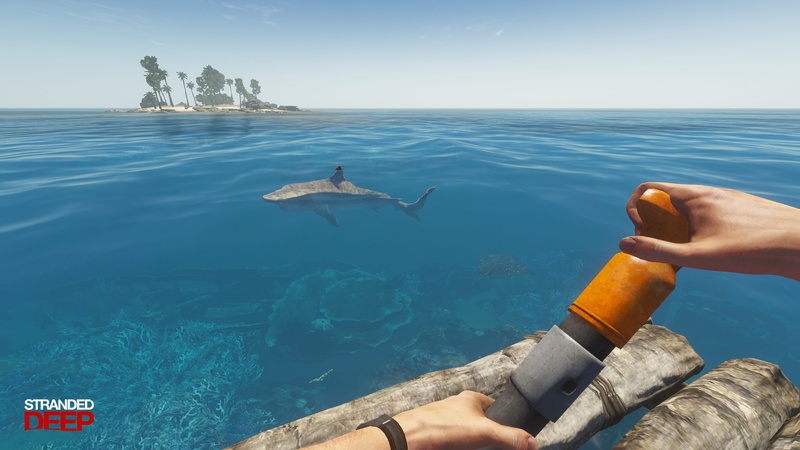 Fast forward a bit to the release of Stranded Deep, a survival game where you wake up on a small island and have to scavenge for items in order to survive. There are lots of islands around, and you can travel between them using a small inflatable raft. When the game first came out controlling the raft was little clunky, it would lag, or you’d slip out of it, or not be able to jump back in properly, it was a pain. Naturally you’re going to have to use it though as the islands you start on only have limited resources. I’m not getting in there if I can help it. My first time setting out in this raft was an experience… I started to paddle out in to the deeper waters; I was loaded up with supplies trying to make my way to another island I might call home. As I got to the point where you basically couldn’t see the bottom of the ocean as it was now so deep I noticed I was being tailed by a shark. That’s fine, I’m in a raft, and if I keep paddling I’ll be fine, right… Not a moment later I was thrown from my raft in to the water and I immediately started to panic. Below me was nothing but darkness and every direction I looked was just blue, no sign of the shark… I quickly swam back to my raft and tried to get back in, but it was taking me longer than I would’ve hoped and I started to get more agitated at the thought of what might be sneaking up around me. Stranded Deep also had ship wrecks that you could swim down to and search, doing this was an equally unnerving experience. 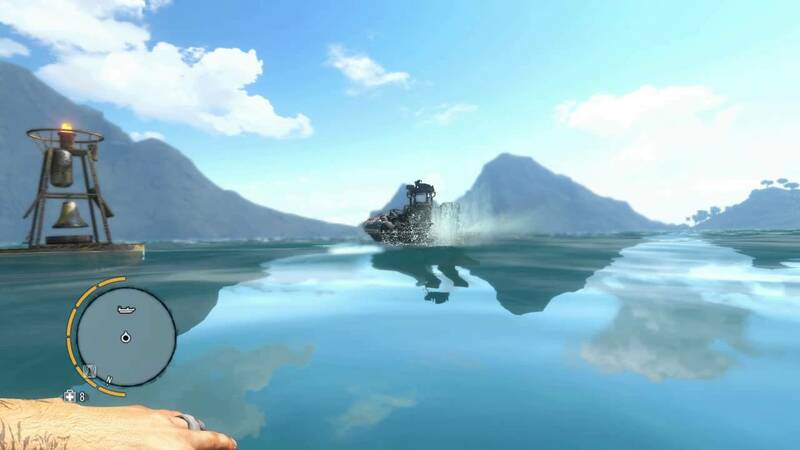 It’s been a few years since I felt that fear of the open water in a game. I’m not entirely sure what it is that freaks me out about it, because I’m fine in the sea IRL and actually really enjoy snorkelling and stuff, but there’s just something about water in video games that gives me the heebie-jeebies. That feeling came back a week or so ago, but I can’t really say too much about it as the game I was playing is under NDA, so I’ll keep it vague. Basically I was sailing on a boat and I got caught in a storm, it was really cool, but I hadn’t noticed that this storm had damaged my ship and it started to creak and crack with the undulation of the huge waves, I was taking on water and it was too late, my ship was sinking and I was in the middle of nowhere. A sense of dread came over me as I had no idea what was going to happen. The music ramped up and added to the tension and drama of me slowly drowning on my ship. The cracks and creaks grew louder, the low drones of music flooded my ears and I had to take my headphones off as the sound was too much. At the end of it I was left stranded in the middle of the sea, floating with nothing around me for what seemed like miles. I was so freaked out I actually stopped playing and went and watched TV. What things in video games scare you? I watched a let’s play of SOMA, which I’m fine with. But no way I would’ve been able to play it. That’s exactly what I had to do! Even just watching it was harrowing, because Frictional Games really knows how to do horror. I know they did the Amnesia series, but apparently SOMA went in a far more existential horror direction and they nailed it. I’ve been working on my review/analysis for it for about six months now, and I hope I finish it up soon in the new year! Oh man there’s that deep ocean VR simulation. You should stay away from that. Haha. Personally what gets me is music. I can’t take suspenseful music. It ruins me. I love reading horror books, and comics, but can’t do movies or games because of that darn music! Music does add a lot to games! Dark Souls 3 scared the pants off of me with two enemies. 1) The river centipedes made out of human body parts, and 2) The priest looking dude who made your health bar disappear. One was just a really gross body-horror creature, and the other was because it happened so subtly. I’m not taking any hits, yet I glance at my health bar only to find it disappearing! Also Hellbalde: Senua’s Sacrifice did a good job with creating a lasting sense of dread. The voices, the darkness, the exhausting boss fights… that game got me in my soul. I’ve been wanting to play Hell Blade for a while, but just haven’t got around to it yet. A river centipede made of body parts sounds pretty disgusting.